By now y’all know how much we LOVE Bloody Mary’s right? So it’s high time we share our favorite recipe and spoiler alert: it’s all available in a kit that launched today! In the kit you get our favorite Bloody Mary mix from Walker’s Feed Co, a mini selection of 4 Florida Pure Sea Salt infused salts, and a jar of Chili Brussels + Sriracha Okra! Also, remember that pickled celery recipe we shared yesterday? This would be a good time to make those too! Rub a lemon slice on the rim of your cup and dip it the infused salt of your choice (we’re digging the vegan maple bacon from our kit). Then fill your cup with ice. Add 2oz of your favorite vodka, and top off to your liking with Walker’s Bloody Mary Mix. Add a pickled celery stalk, lemon slice, and as many pickles as you’d like for garnish and munching. Enjoy! Think this sounds like the perfect gift for your cocktail-loving friend or family member? Maybe it just sounds perfect for you? Our Bloody Mary Kits launched today. Get one here! We’ve got a super fresh, super tasty, and super resourceful #urbantips for you today! Celery is in full force over at our friend’s farm, Little Pond Farm, and we HAD to say yes to this organic, green and full celery. While we used the stems for another recipe coming soon, this celery was so leafy we just couldn’t bear to toss the tops away, so we thought pesto would be the perfect answer! Another big shock we had was how different this celery tasted from store-bought celery. Y’all shopping at the farmers markets and supporting local farms is where it’s at because we can never go back to plastic packaged celery again. You can get Little Pond Farm’s celery locally at the Saturday Morning Market and we advise that you do because the leaves actually have a strong peppery flavor, and that’s what really makes this pesto recipe! Ok now on to the pesto! We took celery leaves and mixed it with parmesan cheese, garlic, pecans or walnuts (we prefer the pecans), lemon juice and more to create a creamy, zingy, and delicious pesto! Feel free to top your grilled chicken with it, or make it the base of your flatbread. We’re feeling a big bowl of pasta, veggies, and this pesto is going to hit the spot this week. The options are endless! Use it within 5 days of making it, but don’t worry, if you can’t finish it in time, just freeze it! Add celery leaves, cheese, garlic cloves, and nuts to a food processor and blend until smooth. Then, add all of the remaining ingredients except for the EVOO. Blend again and slowly pour the olive oil into the pesto until it becomes bright and creamy. Store pesto in jars and use within 5 days. You can freeze a jar of celery leaf pesto for later use and it will unfreeze beautifully. Tell us how you’d use your celery leaf pesto in the comments below! We’re so excited because 1) it’s officially spring, and 2) we’ve got a delicious collaboration with Big Easy Bucha to usher in all the spring vibes! We’re big into kombucha over here and always trying to give our gut some extra love. Have you tried it before? They’ve got all kinds of delicious flavors at Publix like strawberry + honeysuckle, pineapple + elderflower, blueberry + mayhaw, plus more! We’ve been huge fans of Big Easy Bucha for a while now, and it turns out, the feeling is mutual! So we’ve come together to give you a delicious collaboration preserve using only THREE ingredients: mandarins, kombucha, and honey! After drinking some Streetcar Sipper kombucha made with satsumas (mandarins), we knew we had to pair it with fresh mandarins! We’ve preserved them in a light honey-kombucha syrup, and we promise you won’t want to stop popping these gems in your mouth. They’re a little sweet, a little tart, and a whole lotta fresh! We also used local honey from our friends at Queen & Colony. It’s important to use local honey not only because it’s better for you, but also that is just tastes SO much better. We can actually taste the kombucha, honey, and mandarins in each bite. We love having preserved fruit around for all kinds of purposes like snacking, topping yogurt, ice cream, pancakes and more! 1. Fill your canner about 3/4 full of water and place it on the back of your stove. Allow it to come to a boil. 2. Wash your jars, lids and rings in hot soapy water by hand. Place lids and rings on a dish towel on your counter or table. 3. Mix syrup ingredients listed above into a non-reactive sauce pan and bring to a boil. 4. While waiting, add the mandarin wedges into each jar. 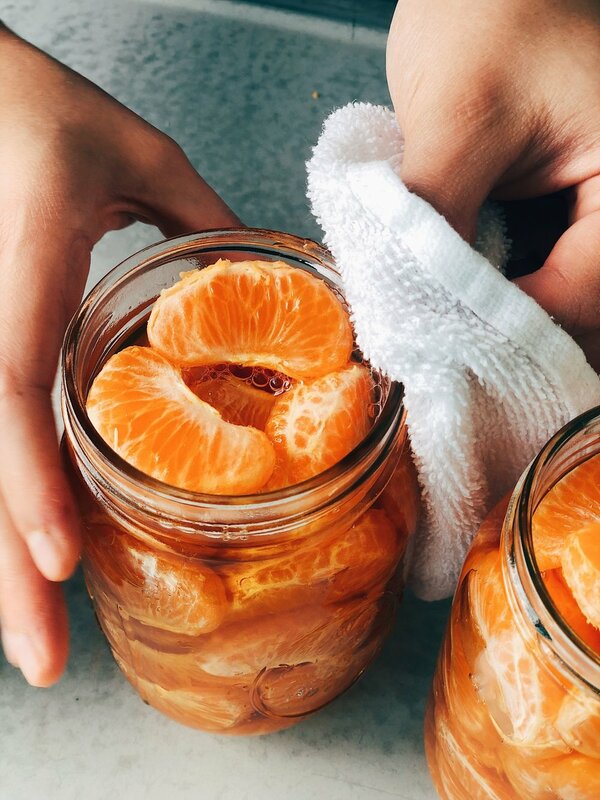 You may find that a bag of mandarin oranges fills 3 jars, it just depends on the size of the mandarins. If you fill 3 jars, add half of what is listed above extra to your syrup mixture while its coming to boil. 5. Once syrup comes to a boil take it off the stove and stir for a minute. 6. Place the canning funnel on your first jar and ladle in syrup leaving a 1 inch headspace. (1 inch headspace is the last line of the thread at the neck of the jar). Fill all jars this way. 7. With a damp cloth or paper towel wipe the rim of each jar. 8. Add lids and rings to each jar, closing each finger tight. You don't have to crank it down hard, just snug. 9. Once your hot water bath canner is at a full rolling boil, using canning tongs add jars to the canning rack then submerge canning rack into the pot. 10. Check and make sure there is at least 2 inches of water over the tops of the jars and that the water is at a full rolling boil. 11. Put lid on and process jars for 10 minutes. 12. When your timer is up remove lid and using jar lifter take jars out of the canner and place them onto the dish towel to cool overnight. 13. The next day check to make sure that the lids are sealed. Date jars and store in a cool dry place. If you have any lids that don't seal place in fridge for immediate use. Allow to cool over night on the counter and date the jars. Refrigerate next day. Allow to cure in the fridge for 2-4 weeks for maximum flavor infusion. P.S. We’ve got a juicy giveaway happening TONIGHT on Instagram! Don’t forget to head over an enter to win! Are you intimidated by the canning process? We don't want you to be! Canning is a preservation method used for hundreds of years, and we want you to feel confident doing it at home! 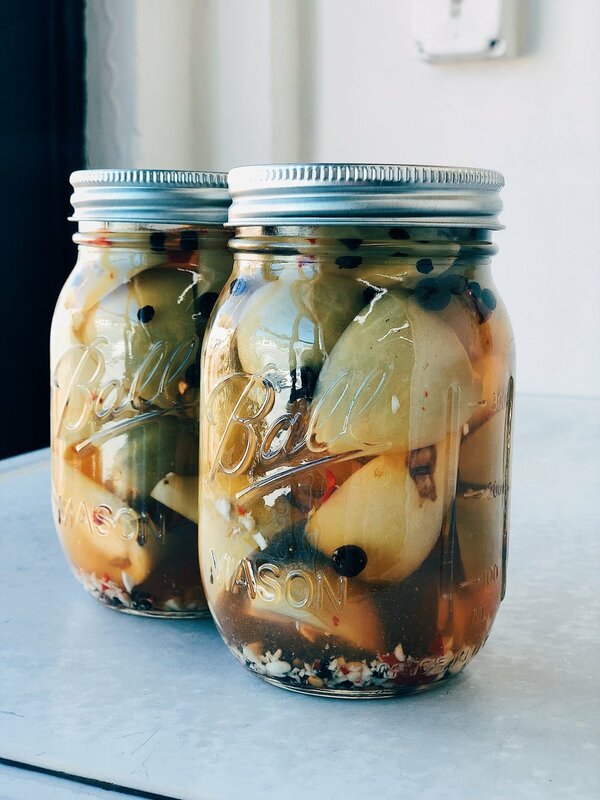 We teach how to pickle, can, and jam in our workshops. Click here to find a class! Calling all BLT lovers, salad lovers, and straight up pickle lovers! We’ve got a delicious collaboration pickle with The Edible Peace Patch Project for you this week. The Edible Peace Patch Project is a non-profit in Pinellas county dedicated to healthy minds and bodies through educational gardening projects in Title 1 elementary schools all over the county! Students get to participate and actually grow food themselves in gardens on school property. The impact is so invaluable to our community. Not only do children get to learn about healthy eating, and see the harvest from their hard work, they also score higher on science tests and have strengthened social skills. We absolutely love this organization and were so excited to make a pickle with produce grown at the schools! This is a southern style tomato pickle with a little hint of spice. We took nice and firm green tomatoes from The Edible Peace Patch Project garlic, allspice, red pepper flakes, clove and more to make a super addicting, but good for you pickle! 3. Mix all brine ingredients listed above into a non-reactive sauce pan and bring to a boil. 4. While waiting, add the spices into each jar. Then pack in your green tomato wedges tightly but not so tight you squish the tomato. 5. Once brine comes to a boil take it off the stove and stir for a minute. 6. Place the canning funnel on your first jar and ladle in brine leaving a 1 inch headspace. (1 inch headspace is the last line of the thread at the neck of the jar). Fill all jars this way. Allow to cool over night on the counter. Refrigerate next day. Allow to cure in the fridge for 2-4 weeks for maximum spice diffusion. We dare you to make the most bomb BLT you’ve ever had with these gems. We know we can’t stop eating them! If you’re interested in volunteering with The Edible Peace Patch Project head over to their site here to see how you can get involved. Is anyone getting sick of strawberries yet? No? GOOD. We never tire of these juicy babes, and we never tire of new ways to use them, like preserving them so we can enjoy them for the rest of the year! 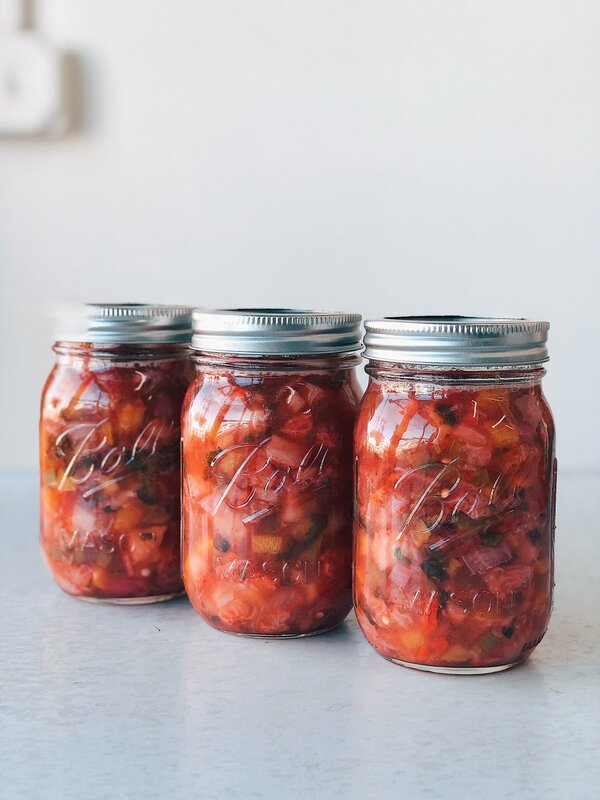 You may remember that we came up with a peach salsa last summer, so we thought a strawberry winter salsa with some habanero heat was the best way to bring some warmth to the cooler days we get! Fill your canner about 3/4 full of water and place it on the back of your stove. Allow it to come to a boil. Wash your jars, lids and rings in hot soapy water by hand. Place lids and rings on a dish towel on your counter or table. Mix all ingredients listed above into a non-reactive sauce pan and bring to a boil. *NOTE: Wear gloves when handling habanero peppers because they will burn much worse than jalapeños. Once it's boiling bring the mixture down to a simmer and allow it to simmer, stirring it frequently, for 10 minutes. Place canning funnel onto your jars and ladle in salsa mixture leaving 1 inch head space. 1 inch is the bottom thread on the neck of the jar from the top. With a damp cloth or paper towel, wipe the rim and thread of each jar. Add lids and rings to each jar, closing each finger tight. Once your hot water bath canner is at a full rolling boil, using canning tongs add jars to the canning rack then submerge canning rack into the pot. Check and make sure there is at least 2 inches of water over the tops of the jars and that the water is at a full rolling boil. Put lid on and process jars for 15 minutes. When your timer is up remove lid and using jar lifter take jars out of the canner and place them onto the dish towel to cool overnight. Next day check to make sure that the lids are sealed. Date jars and store in a cool dry place. If you have any lids that don't seal place in fridge for immediate use. Do you have any questions about the canning instructions, or need help troubleshooting? Leave your question in the comments, or message us on Instagram! It’s National Coffee Day*, and we’re feeling ALL the cold brew coffee vibes (because it’s still way hot here)! We’ve partnered up with our local cold brew friends, Made Coffee this weekend to share a super easy, and delicious treat using nitro cold brew coffee and jam! Yup, coffee and jam work SO well together! And because our A/C was out today and we’re feeling sluggish we created a Caramel Apple Cold Brew Icee. It was so good and cold, and just what we needed to keep us going. In this recipe we feature Made Coffee’s traditional cold brew, however any of their cold brew coffees will work! We also used our Caramel Apple jam. 1. Add everything to a blender and blend until smooth. *If you can’t get enough of National Coffee day, head over to our Instagram where you can enter to win a basket of goodies from us and Made Coffee this weekend! This week we visited one of our favorite St. Pete local spots, Brooklyn South. With love all the way from Brooklyn, this little shop is our go-to for sandwiches and specialty cheese and meats on Central. Meet Matt Bonano, deli owner and local cheesemonger! We spent some time with Matt this week talking about all things cheese, sandwiches, small business, and community*. By now you all know we love cheese. But we hold a special place in our hearts for specialty cheese. That's right, cheese you won't find at a grocery store. Cheese that has such interesting stories and complex flavors they are perfect matches for our jams. So we picked out four cheeses and one of our jams to match with each type of cheese. This cheese comes from North Carolina and provides a firm, but creamy texture. It tastes bright with a gentle smoke flavor from the cow milk. The tang and smokiness in our Smoked Tomato jam will pair deliciously with this cheese. Making blue cheese in southern Germany creates a surplus of milk. So out of that came Cambozola Black Blue cheese. Using a mix of gorgonzola cultures and camembert this cheese is aged in dark caves making the cheese over time savory, and salty, with a hint of sweetness. We chose our sweet, decadent, and slightly floral Blueberry Lavender jam to pair with this cheese. If there's one thing we love it's a blue with blueberries. This is a special gouda because by the time it gets to Saint Petersburg, it's already 2 years old! It spends a year and a half alone just curing in Holland. What makes it really special is that the cows that produce the milk to make this cheese feed on lush grass grown from blue clay. Blue clay is a very nutrient dense soil because Holland is actually below sea level – so you can imagine how fresh and delicious this cheese is! Don't forget to enjoy the tyrosine crystals that crunch when you bite into them, a flavor punch for sure. The spice and subtle sweetness of our Pear Habanero jam will have all your senses tingling. Robiola Bosina is Italy's answer to Brie. While not the same, it has a similar soft and creamy texture. This cheese combines cows and sheeps milk and is aged 30 days to reach its peak flavor. Expect a cheese that's gamey, sweet, milky, soft, and rich. If you're not already drooling over this, be sure to pair it with our Chai Grape, a sweet spiced jam that will have you coming back for more! Next time you're having a wine and cheese (and jam) night, or looking to wow at your next dinner party/date night, be sure to stop by Brooklyn South. Matt will help you find the perfect cheese for the occasion and you'll leave with some new knowledge. If you need a restock on your jams, or want to try a new one for cheese pairing, you can find us at most markets around Tampa Bay, online, or at any of our stockists! *One of the community topics we were talking with Matt about was summer. Summer is a very hard time for all local businesses, especially in St Pete. A friendly reminder to please, please get out and continually support your favorite local companies. We really do depend on EVERY single purchase to get through these hot, inactive summer months. 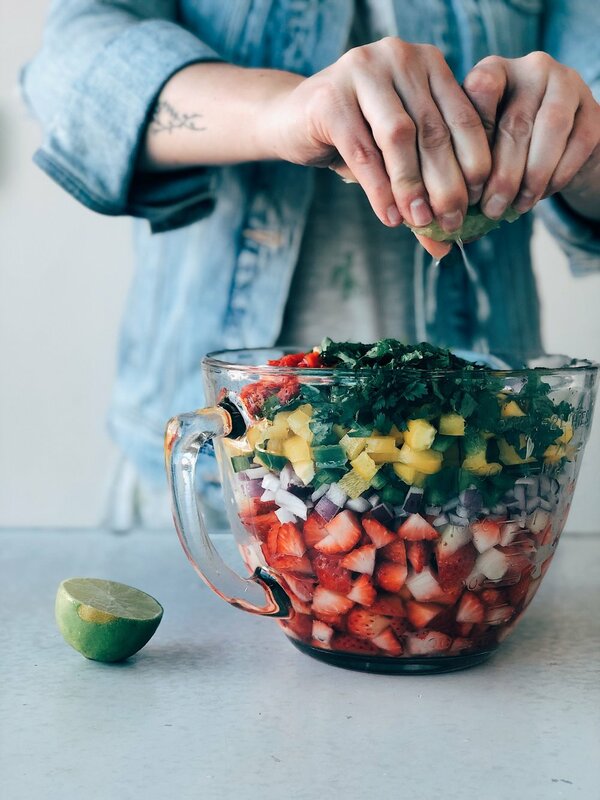 All this rain and hot, HUMID, heat has been making our founder Illene, and marketing manager, Rachel crave their favorite snack-turned dinner: Chips, Salsa + Margaritas!! I mean is there anything better than munching on fresh chips and summery salsa while sipping a cold, tart Margarita? If you ask Rachel, she'd say hell no! Ok, so we're here to teach you how to can this sweet, savory, and spicy salsa from the comfort of your home! Don't worry, it's not as hard or as scary as most people think. You just need a few supplies, the ability to follow instructions, and you're set up for success! Mix all ingredients listed above into a non-reactive sauce pan and bring to a boil.